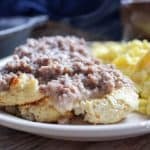 A creamy low carb sausage gravy that will brighten up your morning and make you happy to eat breakfast! This recipe is low carb, gluten free, and a Trim Healthy Mama S Fuel. Yesterday, I posted a recipe for low carb biscuits, and I have been blown away by the response! Several people have already made them and declared them delicious. Apparently people are hungry for a good biscuit option! I posted that recipe yesterday with the intention of posting a sausage gravy recipe later in the week, but there have been so many questions about it, I decided to go live with it today! 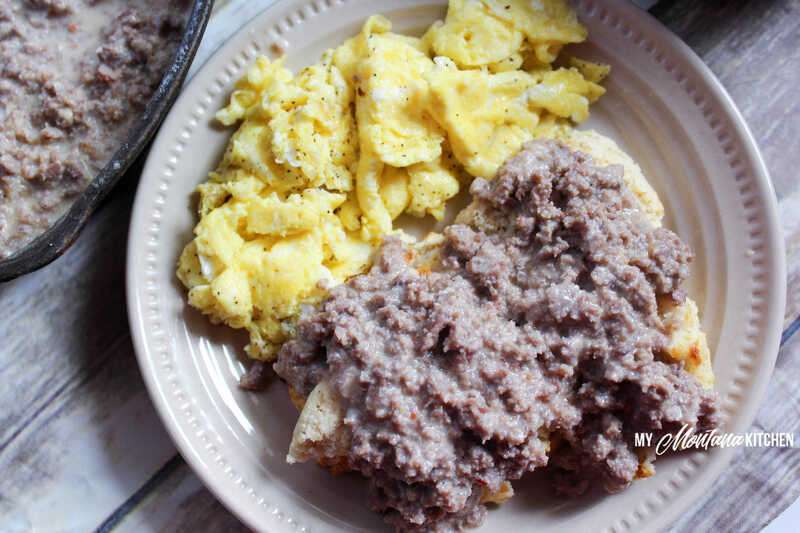 This low carb sausage gravy is so easy to make, that you can have a breakfast (or dinner – I’m not judging!) of biscuits and gravy ready in less than 30 minutes! How is that for fast and easy? The first time I made the gravy, I used all unsweetened almond milk and glucomannan to thicken. It was ok, but it really was not the texture I wanted. I made it again, using Trim Healthy Mama Baking Blend to thicken, and still using all unsweetened almond milk. Again, it was ok, but it was not creamy enough for me. The saying goes “The third try is a charm,” right? The third time I made it, I used the Baking Blend to thicken, and used some unsweetened almond milk and some heavy whipping cream. It was perfect! The Baking Blend was the perfect thing to give it a “regular” mouth feel (like flour-thickened gravy). Honestly, when i had it for breakfast last week, I would not have been able to tell they were not “normal” biscuits and gravy! It was that good! My 8 year old (PICKY) daughter devoured it, as well as several of my dorm boys. One of them even came back to specifically tell me it was good! I call that a score! 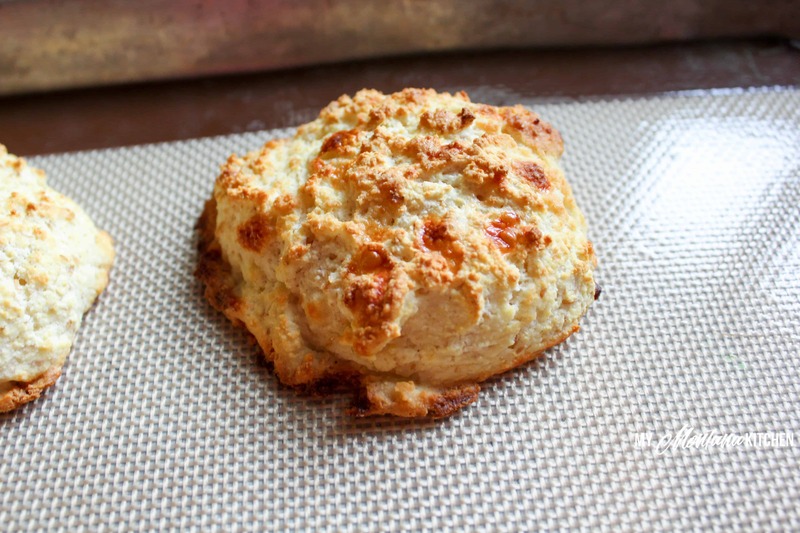 If you are wondering about biscuits, you should try these Low Carb Biscuits! So, what do you need for this Low Carb Sausage Gravy? Be sure to sign up with your email address so you can receive all my new recipes delivered right to your inbox! (Look for the sign-up box at the top of this post.) 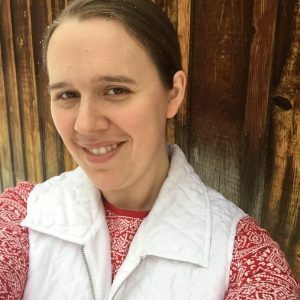 Also, be sure to follow me on Facebook, Pinterest, Instagram, and Twitter! A delicious, creamy low carb sausage gravy that is perfect over low carb biscuits! Sprinkle Baking Blend over cooked sausage, and stir to coat. Enjoy with Low Carb Biscuits! The nutrition information for this recipe is calculated using a generic bulk pork sausage - nutrition facts may vary depending on what sausage you use. If you do not have the Trim Healthy Mama Baking Blend, you can probably use 3 Tablespoons each of Almond Flour, Coconut Flour, and Flax Meal. Please note: The nutrition information below is calculated using a generic bulk pork sausage – nutrition facts may vary depending on what sausage you use. The nutrition facts are for gravy only – these do not include the biscuits. Can you substitute ground beef for the sausage? Thank you so much!!! I have been missing having biscuits and gravy. Glad to see a way to enjoy them without sugar spiking! How do you make your own sausage? I do not have a specific recipe – my husband adds spices to our home-grown ground pork to make sausage. Can you reheat the gravy? Not sure we can eat all of it in one meal and I don’t want to waste it. Yes, it should reheat great! Do you think you could use cashew milk? It is what I have on hand. Made your wonderful biscuits yesterday! I am stopping at the store tomorrow to buy sausage. I can’t wait to try your gravy! (On top of your yummy biscuits!) Thank you! Hi Sarah, Could you use half and half instead of heavy cream? I have half and half on hand. Thanks! Yes, I think so. It will not be as creamy, but should still work! I used unsweetened coconut milk. To me it has less flavor than the almond milk. Delicious!!! Thank you for the recipe.